^ André Vauchez、Richard Barrie Dobson、Adrian Walford、Michael Lapidge. Encyclopedia of the Middle Ages. Routledge. 2000年: 第361頁. ISBN 1579582826 （英语）. ^ Steven Runciman. The Sicilian Vespers: a history of the Mediterranean world in the later thirteenth century. Cambridge University Press. 1958年: 第39頁. ISBN 0521437741 （英语）. ^ Deno John Geanakoplos. Constantinople and the West: essays on the late Byzantine (Palaeologan) and Italian Renaissances and the Byzantine and Roman churches. Univ of Wisconsin Press. 1989年: 第173頁. ISBN 0299118843 （英语）. ^ Gülru Necipoğlu. Architecture, ceremonial, and power: The Topkapi Palace in the fifteenth and sixteenth centuries. Massachusetts. 1991年. ISBN 0-262-14050-0 （英语）. ^ Christopher Kelly. Ruling the later Roman Empire. Harvard University Press. 2004年: 第32頁. ISBN 0674015649 （英语）. ^ George P. Majeska. Russian travelers to Constantinople in the fourteenth and fifteenth centuries. Dumbarton Oaks. 1984年: 第34頁. ISBN 0884021017 （英语）. ^ David Marshall Lang. Armenia: cradle of civilization. Allen and Unwin. 1970年: 第186頁 （英语）. ^ Elisabeth Piltz. From Constantine the Great to Kandinsky: studies in Byzantine and post-Byzantine art and architecture. Archaeopress. 2007年: 第14頁. ISBN 1407301047 （英语）. ^ Nevra Necipoğlu. 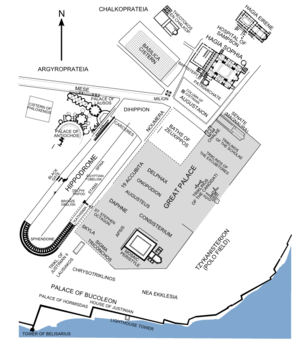 Byzantine Constantinople: monuments, topography, and everyday life. BRILL. 2001年: 第168頁. ISBN 9004116257 （英语）. ^ Wolfram Brandes、Wolfram Brandes、Helmut Krasser、Hartmut Leppin、Alexander Demandt、Peter Von Mollendorff、Alexander Demandt、Hartmut Leppin、Helmut Krasser、Peter von Mollendorff. Millennium- Jahrbuch/ Millennium Yearbook: Jahrbuch zu Kultur und Geschichte des ersten Jahrtausends n. Chr./ Yearbook on the Culture and History of the First Millennium C. E.. Walter de Gruyter. 2004年: 第391頁. ISBN 3110180359 （德语）.